Flying over Ocho II, it’s lush red grass as far as the eye can see. It’s been a while since I’ve played No Man’s Sky and, to be fair, I thought I had completely written this game off entirely. When it first released in August of 2016 I fell deep into the hype trap, even shelling out the full $60 tag, something I am usually loath to do, and was subsequently burned. Once bitten, twice shy. After some more recent hype revolving around No Man’s Sky, though, this time with a $0 pricetag since I’ve already bought into it, I decided to hop back in and check out what has really changed since launch. 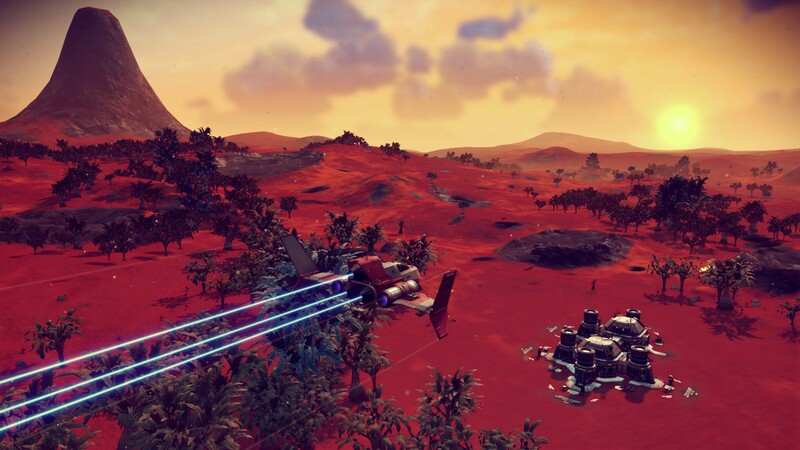 Find out what the ‘Next’ really means of the now titled ‘No Man’s Sky Next’. Turns out, quite a bit has changed. First of all, I find it weird that I’m using terminology and treating this game like it’s some sort of MMO, which now that there is some sort of real multiplayer going on I guess it is much closer to that now. 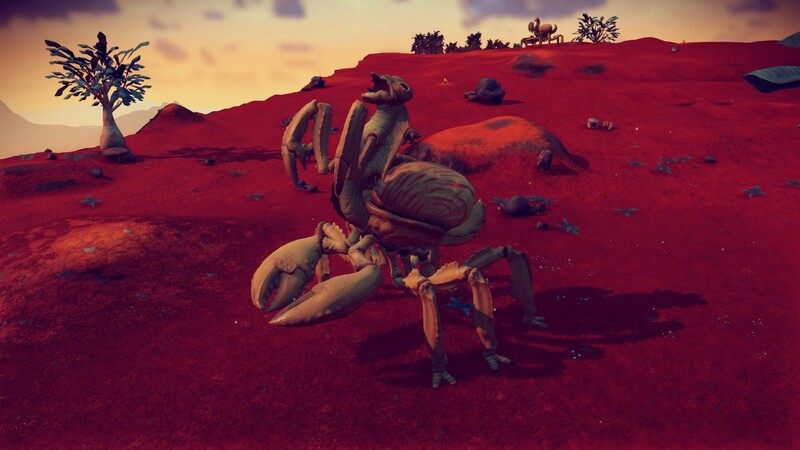 For all intents and purposes, though, No Man’s Sky still feels mostly single player. Which is fine by me. Usually, as a solo player, encountering other players in MMOs turns adversarial. We’re either fighting over the same drops, the same mobs, or fighting each other. That, as players, we’ve grown to consider this infighting ‘good, normal’ and ‘the way it should be’ is… odd. But I digress. 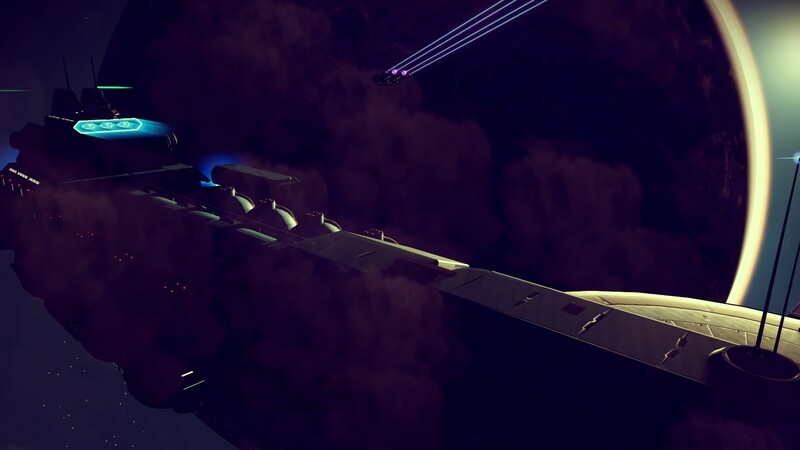 Coming in for a landing on the freighter Deep Space Ocho. I remember when No Man’s Sky launched it felt like a wide ocean of content that was only a puddle deep. Everything was large and grand, but nothing felt important. There was no weight. Upgrades were acquired almost by accident and the primary focus was exploration… of similar, not-that-exciting locations. You could complete 99% of the game by just staying on the same planet you started on. Now? Well, I’m not *entirely* sold that it’s monumentally different, but it does feel a lot better. The focus has absolutely changed. Now the focus is about building up your properties, your freighter fleet and your base, and completing the story missions. Your time spent on planets is transitory, hitting up only the points of interest you need to, and moving on. Which is good, because the less you see and pay attention to the procedural generation, the better. There was just not enough difference in the generation before. Now, it just feels… better. Planets feel more varied and look more populated. There’s more variety. I mean, there could always be even more variety in a game like this, but you don’t see the man-behind-the-curtain as much as you did two years ago. What were the devs smoking when they made *this* a possibility? Upgrades, too, seem to be made more from progress than from randomness, which is a much better feeling than just stumbling across the best weapon/ships in the game. That random big find is still included, too, though, but now instead of finding a big new ship, you now find a big *broken* ship that you need to spend a good chunk of time and resources fixing. Again, it feels productive, not accidental. This is good. 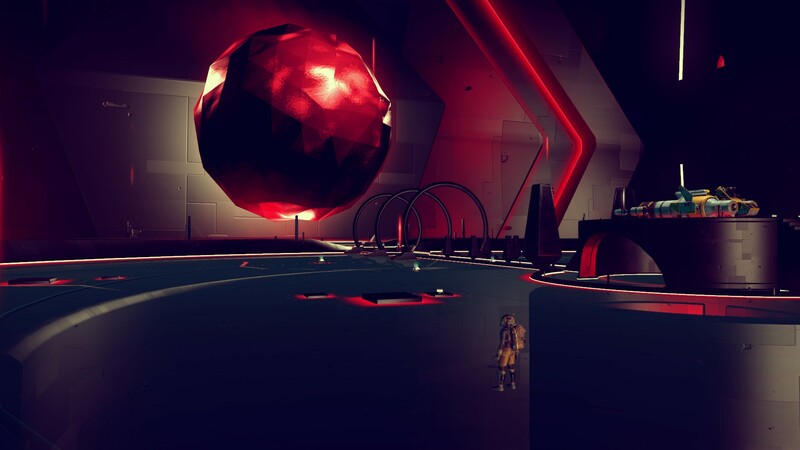 Ah yes, the big red ball… things. Also, we need to talk about the screenshot capabilities. They are, hands down, the best screenshot options I have ever seen in any game. Period. And I consider myself a screenshot aficionado, so I don’t say this lightly. At any time you can pause the game to take a screenshot. When you do, you can move the camera to any position around your character to take it, within a large distance. On top of that, if the lighting isn’t right, you can change the time of day and the position of the sun. You can add/remove clouds, change the depth of field, and even add an Instagram-like filter on top of all that. 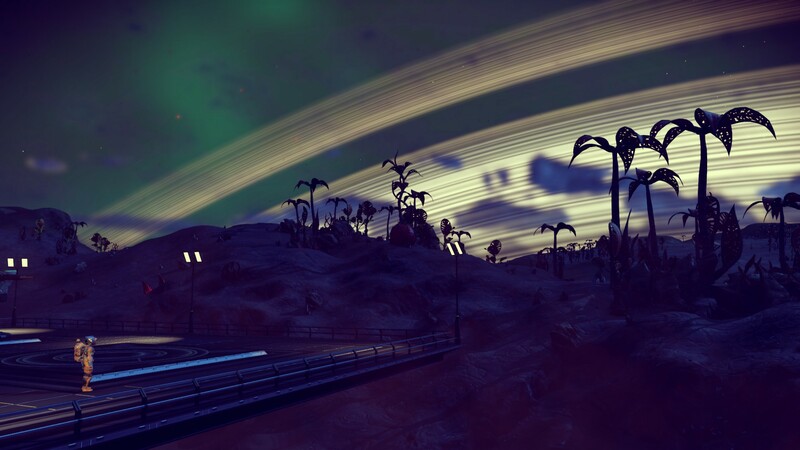 For real, all other games need to take a page from No Man’s Sky’s screenshot book. Screenshots are your players methods of advertising your game for you, and having a system like this only helps you. The Rings at Night! Glow Big and Bright! *clap clap clap clap* Deep In the Heart of… of… wherever this is. So will I keep it up? No, of course not. 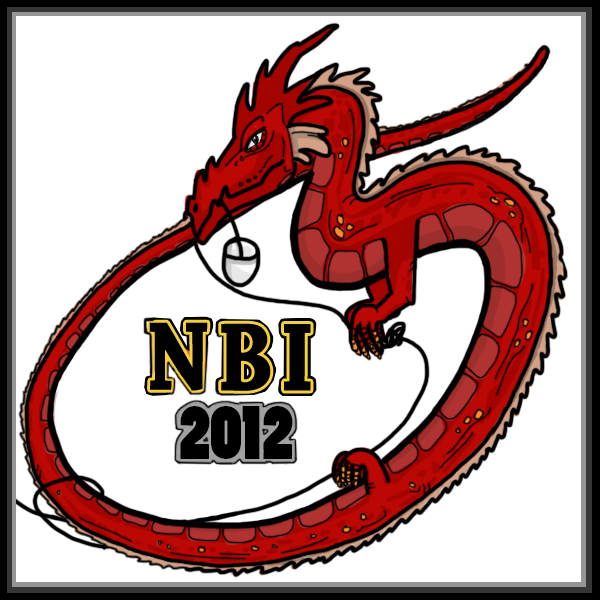 I’m a rambling gamer and will pass quickly from game to game as my whim takes me. However, with No Man’s Sky focus having changed to one that feels purposeful instead of accidental, I’m a lot more apt to keep it going. Plus, the entire game fits into only a 10 GB footprint, which is efficient and impressive as anything. It currently is still sitting at $60, though, which I wouldn’t say feels entirely worth it, but if it falls back down to $30, or even $40, I wouldn’t hesitate to suggest snapping it up. P.S. – If you’re looking for a good planet to settle down on, I highly suggest planet Ocho II in the Mucalls system. Red grass, bright sun, abundant resources, and a pleasant temperature all year long. Nice place to vacation. Just don’t murder me, okay?